Photo courtesy of Shelley Young. Shelley Young is a lifetime "Hopite" sharing her blessings through love and laughter. Quilts! They seem to be consuming my life right now. But in a good way. Let me take just a step back. I have a bit of a love affair with fabric. Tree City Stitches in Greensburg is rather addictive to me. JoAnns is a regular stop almost weekly. A good sale is hard to pass up. I said yesterday that I was teetering on the edge of being a fabric hoarder. Ayana said I have done teetered over the edge! So with all that fabric I have to have projects. 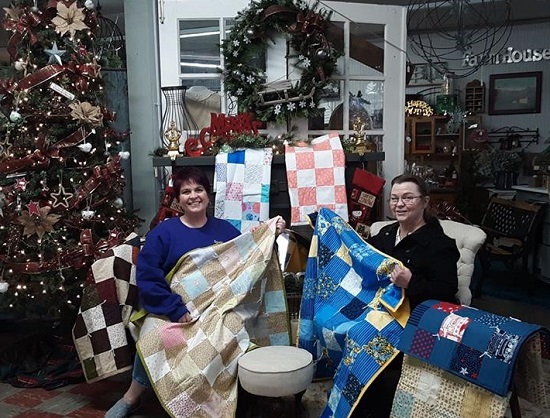 This year I enlisted my friend, and fellow fabric hoarder, Kate Phillips, to help me with a project that was special to me. I wanted to make lap quilts for those in need at the local nursing home. I started cutting fabric into 5" squares and matching it up to make simple lap quilts. I took these "kits" to Kate so that she could start piecing them together. I still think she took all my kits threw the squares into a huge pile, stirred it up, and then started putting tops together. In true Kate fashion, they turned out beautiful! I have been putting the batting and backing on them so that they can be taken to the nursing home before Christmas. I hope the residents will enjoy Kate's beautiful creations as well as feel the warmth and love that has went into making these quilts. Along with making quilts myself, I love to see those that are made by others. I am often inspired by others creations. I went to the Hope Christmas walk last month. I stopped at Willow Leaves and was admiring a quilt that was laying on a table. I knew that this was a very unique piece. You could feel just how special it was just by touching it. I could see that it was made from some old bibs that no doubt had been worn by someone special. There were other fabrics in the quilt as well. As I stood there, touching the quilt, David Webster came up to me.He proceeded to tell me that, indeed, it was a very special quilt. The bibs it was made from were worn by his father. I remember that the designer had even put in the loops from the bibs that held tools. I believe there was a handkerchief along with a few other special pieces of memories added in. The more I knew about the quilt, the more incredible it became. The memories, the meaning and the love in that quilt will last a lifetime. I don't know that we realize just how blessed we are to have quilts. Those that are made with love, giving and compassion. We can wrap ourselves in them to stay warm and have a feeling of being safe. As we approach the birthdate of our Lord Jesus Christ I think that He was sent here to be our spiritual quilt. He is Love, He is Giving and He is Compassion. If we allow Him to, He will wrap His arms around us and He will keep us safe. I hope that you all have a very Blessed Christmas and that the New Year will bring you love, peace and joy.